Alpha Du Cap Guest House offers comfortable and affordable accommodation conveniently located in Bloubergrant, between the City Centre and the West Coast, in the Western Cape of South Africa, providing excellent service for holiday makers, water sport fans and business travellers. 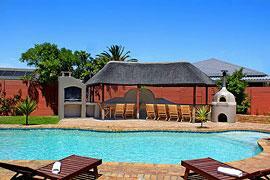 Relax by the sparkling pool or in our lounge at Alpha Du Cap Guest House. Only meters away from pristine beaches, trendy bars, restaurants and shops. One of our two lounges and the beautifully landscaped garden with paved terrace, palm trees, Lapa and 10 meter swimming pool is the perfect place to dine, relax or sun bathe after a busy day at the office, your in-house conference or a hectic day sightseeing. 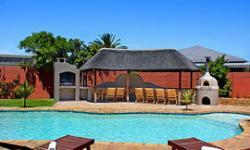 Most of the 7 bedrooms face towards our beautifully landscaped garden with its large pool, lapa, Jacuzzi, braai and pizza facilities.
? Our Standard Double Bedrooms have queen-size double beds and en-suite heated bathroom with shower.
? Our Luxury Twin Bedrooms have en-suite bathrooms with shower and bath tub, spacious seating and a working desk.
? Our Luxury Double Bedrooms have en-suite bathrooms with shower and bath tub, spacious seating and a working desk.
? Our Junior Family suite consists of a Luxury Double Bedroom with interleading Twin Bedroom (altogether the unit sleeps up to 4 people), sharing a heated en-suite bath room with a shower and bathtub.
? Our Grande Family Suite consists of a Luxury Double Bedroom and interleading Twin Bed + Double bunk bedroom (altogether the unit sleeps up to 6 people), sharing an heated en-suite bath room with shower and corner bath. 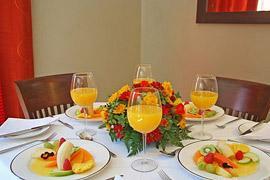 Enjoy a sumptuous full English or Continental breakfast served each morning in our chic dining room or on the terrace. 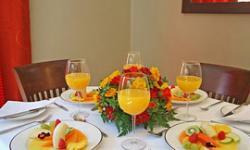 For your in-house functions, the Alpha Du Cap Guest House provides a 20 seater banqueting room equipped with state-of-the-art conferencing equipment and a bar / kitchenette. Free wireless internet, fax and copy facilities. Tea, coffee, biscuits, and light lunches on request. The best location between the City Centre and the West Coast. 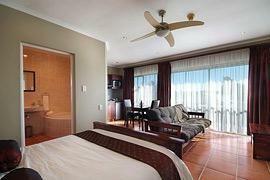 Alpha Du Cap Guest House is situated in the Blouberg area, just off the West Coast Road (R27), only 20 min. 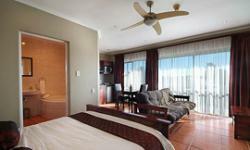 away from the international airport, the Cape Town City Centre and the V & A Waterfront. The beach, one of the world's premier kite surfing hot spots with the spectacular view of Table Mountain is only a 10 minute walk from our guesthouse.